Source: CICH graphic created using data adapted from First Nations Information Governance Centre, Our Data, Our Stories, Our Future: The National Report of the First Nations Regional Early Childhood, Education and Employment Survey. 2016. http://fnigc.ca/sites/default/files/docs/fnigc_fnreees_national_report_2016_en_final_28072016_0.pdf-accessed August 25, 2017. 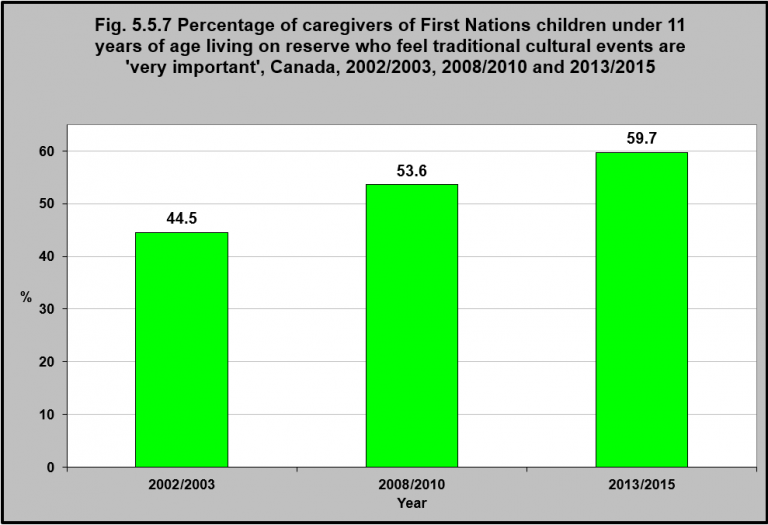 The percentage of caregivers of First Nations children under 11 years of age living on reserve who feel traditional cultural events are ‘very important’ has been increasing. In 2013/2015, 59.7% of caregivers felt traditional events were ‘very important’, compared to 53.6% in 2008/2010 and 44.5% in 2002/2003. Culture is an important component of healthy child development. Culture contributes to the development of a sense of identity and belonging, which is important for an individual’s psychological functioning, relationships with their peers, and academic achievement, as well as for the wellness of families and communities.2 One means of maintaining and preserving culture among Indigenous children is by encouraging them to participate in cultural events such as drumming, dancing, singing songs, hearing stories, tasting traditional foods, making crafts, touching nature, learning about plants and animals, and participating in traditional food gathering practices such as fishing, hunting, and berry picking. 2Lalonde, C.E. (2006). Identity formation and cultural resilience in Aboriginal communities. In R.J. Flynn, P.M. Dudding, & J.G. Barber (eds.). Promoting resilience in child welfare (Ch. 4).. Ottawa, ON: University of Ottawa Press.